Sunday morning August 10, the Washington Post offered readers a front page story about US swimmer Michael Phelps’ gold medal victory in the 400-meter individual medley, the first of eight he would earn at the Beijing summer Olympics. How has the U.S. press covered the Olympics Games? To what extent did the news media take the opportunity to cover the country of China while they were there? And how has U.S. coverage differed from that in other countries? To get answers, the Pew Research Center’s Project for Excellence in Journalism conducted a special analysis of coverage of the Olympics and China generally in the week leading up to the Games and during the first week of competition. The study finds that the coverage has been heavily tilted toward just three areas of competition—swimming, gymnastics and track and field. No other sport has attracted much news coverage at all. The games were also dominated by a single athlete, Michael Phelps, with virtually no one else really emerging as a major figure, including the star female gymnasts. In general, in the final days leading up to the Olympics and the first week of the competition, the press focused primarily on the Games rather than life in China or its political matters there. And NBC News, which is in somewhat of a more complicated situation journalistically because of the financial stake its corporate parent has in Olympic ratings, has devoted three times as much of its newshole to the Games as has its journalistic competitors. These are some of the findings of the study, which is based on an analysis of more than 390 news stories about China or the Olympic Games that appeared from August 3 through August 17, 2008—the week leading up to the Games and the first week of the Games themselves. The majority of data is drawn from 48 different news outlets that make up PEJ’s weekly News Coverage Index, including outlets from newspapers, online, network TV, cable TV, and radio. The study also looked at the Web sites of popular papers in three foreign countries: Russia, China, and Great Britain (Rossiyskaya Gazeta and Komsomolskaya Pravda from Russia, The People’s Daily and Yangtse Evening Post from China and The Sun and Daily Telegraph, from England). The study examined news coverage of the games, not the live coverage of the Olympic events themselves carried on NBC and its various TV channels. Overall, the Olympic Games in Beijing as a news story ranked No. 2 during the two weeks studied, well behind the race for president but roughly equal to the military conflict between Russia and Georgia. In all, 14% of the newshole studied by PEJ was about China and the Games, compared with 13% for the war in Georgia, and 23% for the election. But that did represent a drop of more than 20% from the amount of election coverage seen in the six weeks prior to the Games. NBC, the network that has the exclusive rights to air the games, devoted roughly triple the amount of coverage to the Olympics as did other news outlets in the United States PEJ examined. Its two main news programs on NBC, the Today Show in the morning and the NBC Nightly News together have devoted nearly half their newshole (48%) to the games or to stories about China. The news talk shows on the network’s cable channel, MSNBC, in contrast, stuck to their usual diet—politics. News coverage of the Games at the halfway point was heavily tilted toward just three types of competition. Swimming and diving filled 38% of the news coverage—and that was four times the next nearest sport. And other than gymnastics and track and field, (which were tied but far behind), no other sport received even 1%. 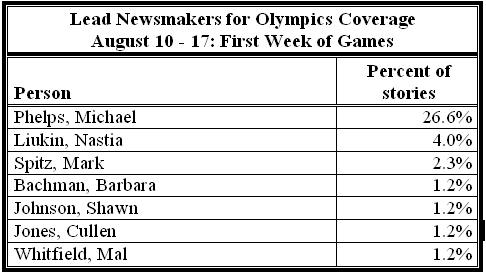 During the first week of the Games, only one athlete has emerged as a major news figure, and he has thoroughly dominated the coverage. Michael Phelps was the focus of more than one out of every four stories studied. That, in turn, was nearly seven times the coverage of the next nearest athlete, all-around gymnastic star Nastia Liukin. All of Phelps’ fellow male swimmers combined made up just 3%. The week leading up to the games created an opportunity for the U.S. media to focus on China as a country. During that time, the media used that opportunity largely to talk about preparations and Olympics security. Stories about the opening ceremonies and Chinese preparations for the games both made up 18%. China’s political system made up just 2%. The ne political issue that did get sizable attention the week prior was human rights (13%), though there was no coverage of the issue once the games began (for a total of 7% of Olympic coverage). This does not include whatever coverage of China American media did in the months preceding. Some past Olympic storylines have been largely absent. Only 1% of the coverage, as an example, focused on steroids or doping. 1. PEJ’s weekly News Coverage Index examines the first 30 minutes of the Today Show and the two other network morning television broadcasts because those are usually the segments of the shows that are devoted to the leading news of the day.